Ladybug: Exciting things are happening at the Sunshine Farm Girl Co-op! We have changed the way we play our BNS game. Starting this Monday we will have a daily deal board instead. Mary our Curator will change the shops like in a BNR. When a sale is made in your shop the shop that bought from you replaces you on the board. Any Etsy seller can participate in our game! Please stop on by and fave, tweet, fb, blog, post on teams and anything else you can do to promote. Lets work together to make this BNR the best on Etsy!!! Here is the interview that I conducted with Della. 1. What are some things that you use for inspiration when you are designing an item for your shop? I love ribbon and I'll often design a project around it. I'm also inspired by color combinations that I see around me such as in nature, the current color trends in home decor and in attractive ads. I'm always thinking about "What makes me buy this product?" Is it the packaging, color, message? 2. Do you ever get custom orders? If so what advise do you have for other team members on how to make sure that your customer is happy with your finished product. Yes. I do quite a bit of custom work locally. 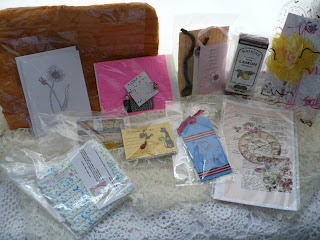 For my online shops, I offer personalized messages in my cards and color customization on some of my gift items. Communication helps with customer satisfaction. To make custom work profitable, I find it helps to have a basic design that you then customize. 3. What are your short-term goals for your shop? To have 150 items. What are your long-term goals for your shop? To offer kits with instruction and monthly subscription items. 4. Are you currently having any sales? Yes, I've steadily increased my sales this year. 5. Do you have any current coupons for your shop? 4. Make a purchase from Creativedesignsbydella and get 5 extra entries. Blog Advertising: Get your Etsy shop mini on our blog for just $7 a month! New Deal of the Day items now up! Come see what they are at the link above! Loving the Daily Deal!! Everyone needs to stop by and check this out. . . some fantastic deals are waiting! We are having a flurry of sales at our online craft show!!! Come on over and see what all the stir is about!!! Daily Deals you can't afford to pass up!!! hehe! So exciting to be featured this week!! The bnr is really fun. I've done some shopping myself! Hi Team, this is Ladybug....I will have the new blog post up tonight. Sorry team, I was traveling today from Boston and I just got in. I favored all the shops for Cyber Monday. Love the new page design too!